Eric F. Spina has served as president of the University of Dayton, a top-tier national Catholic research university, since July 1, 2016. 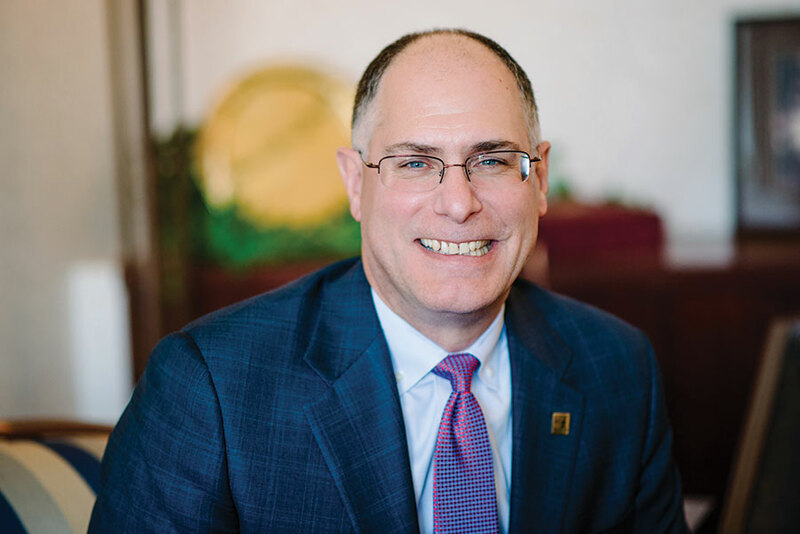 An engaged, energetic leader, Dr. Spina has made investments in initiatives targeted toward increasing diversity and accessibility, key strategic focal areas of his presidency. The fall 2018 class is the most diverse and academically talented class in school history. Respectful of the University’s role as an anchor institution in Dayton, Dr. Spina partnered with Premier Health to purchase the former Montgomery County Fairgrounds, envisioned as a tableau for future economic development and enhancement of the Fairgrounds neighborhood. The University also has embarked on the largest construction project in its history — a three-year $72 million renovation of the University of Dayton Arena, funded with significant private support — and a two-story academic and office building that will house the Fitz Center for Leadership in Community, the Dayton Foundation and the Dayton Development Coalition. Located adjacent Emerson's Helix Innovation Center on campus, the facility will be a national model for ways universities can collaborate with a community's regional foundation and economic development arm to promote the common good. The Adèle Center, an $11.2 million townhouse-style residential building in the heart of the south student neighborhood, opened its doors to students in fall 2018. In the academic arena, the University partnered with 2U, one of the foremost education technology companies in the U.S., to create online graduate programs in business, education and law that will extend UD’s reach in new markets. When Law@Dayton launches in fall 2019, it will be one of the nation's first accredited hybrid Juris Doctor programs. Annual sponsored research has continued its upward momentum to a record $150 million, a testament to the creativity, innovation and ingenuity fostered in the labs and classrooms. Dr. Spina (@DaytonPrez Spina) is the first University of Dayton president to engage with the campus community, alumni and friends through the tools of new media — and he’s prolific about it. He’s built a fan base — and a reputation as a compelling storyteller — through tweets, Instagram photos, blogs and LinkedIn articles. Nationally, he serves on the steering committee of the American Talent Initiative, a collaborative of universities with high graduation rates that are dedicated to substantially expanding opportunity and access for low- and moderate-income students. In 2019, he was named to a three-year term as an at-large member of the board of the National Association of Independent Colleges and Universities. Before taking the leadership helm at the University of Dayton, Dr. Spina developed a stellar reputation for scholarship, teaching and research at Syracuse University, where he served as vice chancellor and provost for nearly nine years of his 28-year tenure. He began his career at Syracuse as a faculty member in the College of Engineering and Computer Science, earned tenure and was named chair of the Department of Mechanical, Aerospace and Manufacturing Engineering. In 2003, he was appointed the Douglas D. Danforth dean of the College of Engineering and Computer Science, a position he held until his appointment as interim vice chancellor and provost in July 2006 and vice chancellor and provost in 2007. In 2013, Dr. Spina also served as interim chancellor and president. As a mechanical and aerospace engineer, Dr. Spina has more than 20 years of research experience in experimental fluid mechanics. He has served as principal or co-principal investigator on grants from the National Science Foundation, NASA and EPA. He holds two U.S. patents, has published more than 30 refereed archival and conference papers, and has edited books and conference proceedings. His most important work is on the physics of high-speed turbulent boundary layers, which culminated in a paper in the Annual Review of Fluid Mechanics. Dr. Spina also played a leading role in developing university and state initiatives in indoor environmental quality and environmental quality systems at Syracuse, and helped to secure more than $100 million to support this work. In recognition of his work, Syracuse awarded Dr. Spina one of its highest honors — the Chancellor’s Citation for Outstanding Contribution to the University’s Academic Programs. Dr. Spina has also been honored by NASA and the National Science Foundation and received numerous department, college and University teaching awards. A Roman Catholic and native of Buffalo, New York, Dr. Spina graduated from Canisius High School, a Jesuit school. He earned a Ph.D. and master's degrees in mechanical and aerospace engineering from Princeton University and a bachelor's degree with university honors in mechanical engineering from Carnegie Mellon University. He and his wife, Karen, have two children, daughter Kaitlyn and son Emery.